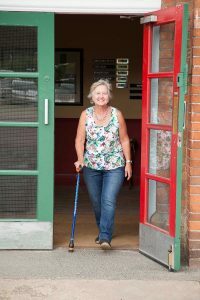 Budget Express RangeBudget express range of disabled access ramps and platforms that offers fantastic value for money. 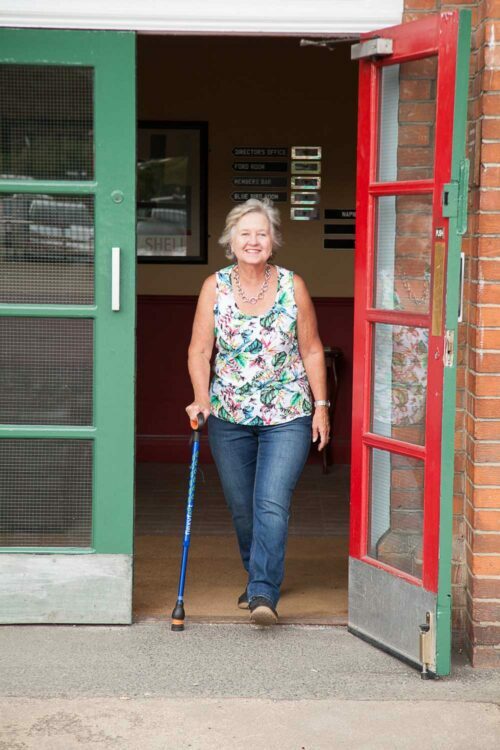 Mobile RampsDesigned for wheelchair access in public or commercial buildings where quick access and limited storage space is required. Mobility Scooter RampsThe perfect solution for loading scooters into vehicles. Portable Channel RampsThe perfect solution for access problems when bridging gaps or loading vehicles. Ramp PlatformsUsed to create a permanent modular ramp system. Threshold RampsPortable threshold ramps used to bridge door thresholds, UPVc door frames, conservatories, patio’s, kerbs or small steps. Wheelchair RampsA comprehensive range of access ramps designed for wheelchair users. Ramp AccessoriesRamp Accessories designed to make access ramp systems even more adaptable. Evacuation ChairsErgonomically designed to transport someone with impaired mobility in an emergency situation. 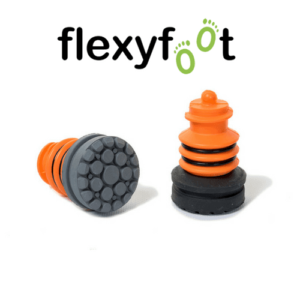 Flexyfoot Walking Aids and AccessoriesAward Winning & Revolutionary Range of Flexyfoot Walking Aids and Accessories. 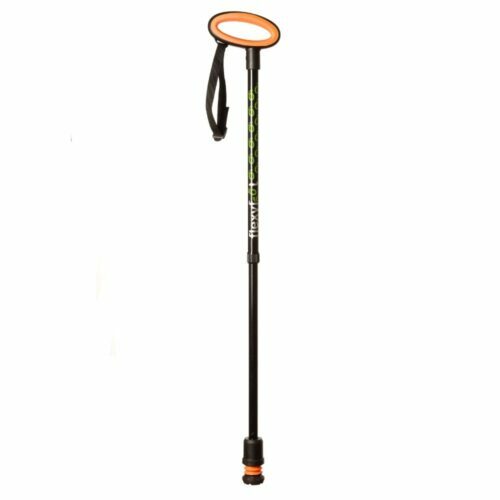 Easy height adjustment from 70cm – 96cm. 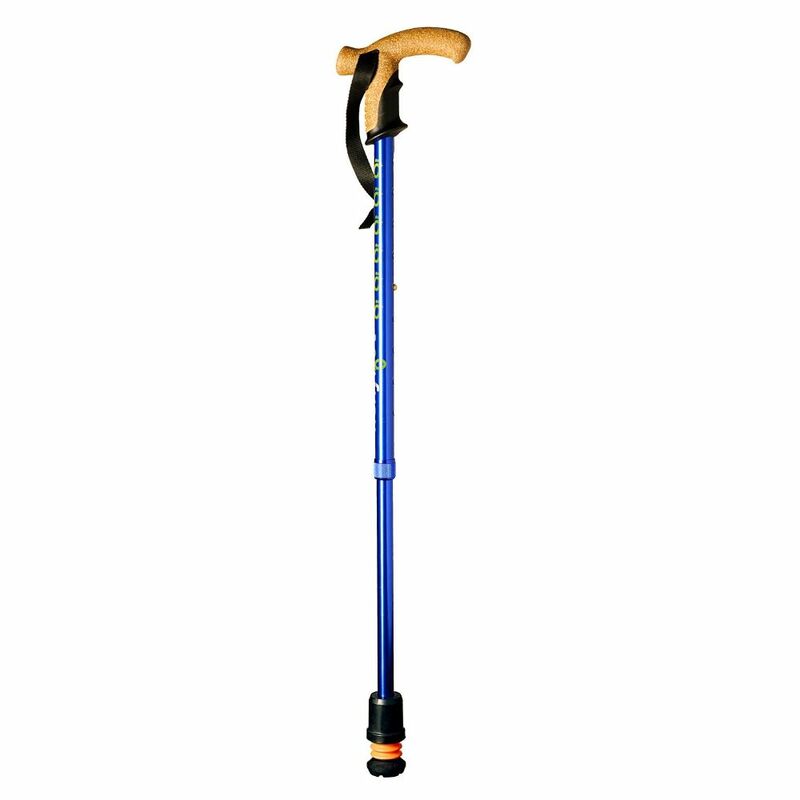 The Flexyfoot Telescopic Walking Stick comes in two distinct colours: Black or Blue. Choice of Handles: Cork or Oval. The Flexyfoot telescopic walking stick is a premium walking aid that has been ergonomically designed to be both functional and comfortable for people with limited mobility and also includes the Flexyfoot Shock Absorbing Ferrule fitted as standard. What are the benefits of using the Flexyfoot Folding Walking Stick? 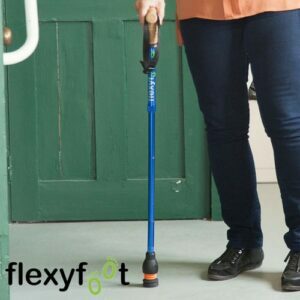 The Flexyfoot walking stick spreads the forces over a wide area of the hand to reduce the stress and impact on the user. The rigid telescopic design allows for easy height adjustment. 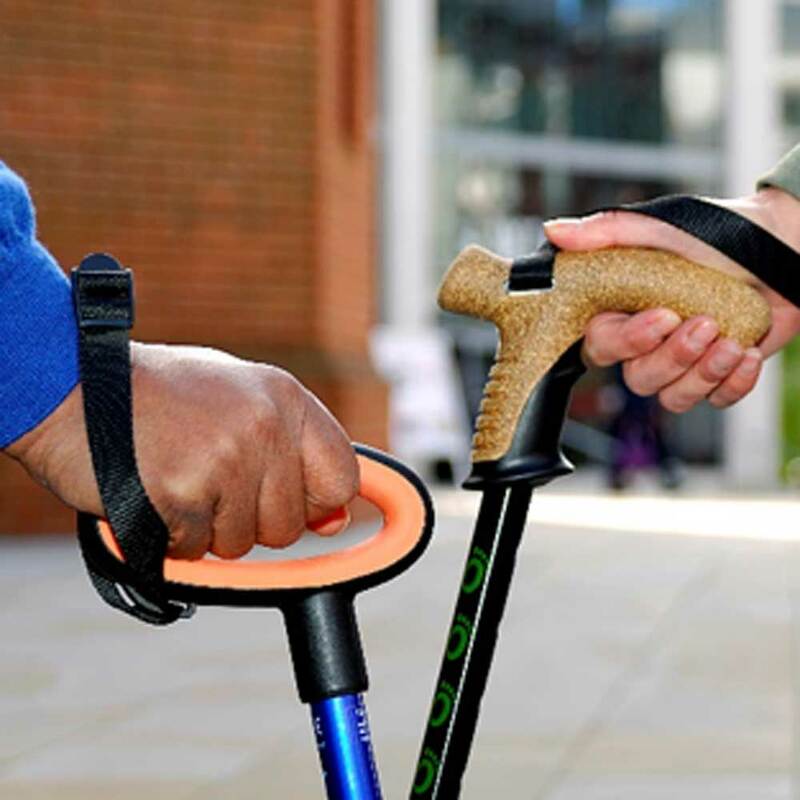 The stick and handle have been designed so the weight of the user is directly over the stick which reduces strain and injury by keeping the wrist and hand in a natural position. Finished for durability in an anodised layer by an electrolytic process with screen printed graphics and comes supplied with its own carrying bag. Sporty cork handle with wrist strap. 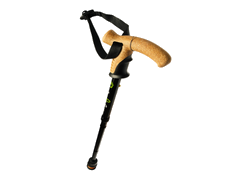 For ultimate comfort the cork handle makes your walking stick feel more like a sporty hiking pole but still retains the weight bearing capability of a walking stick or cane. 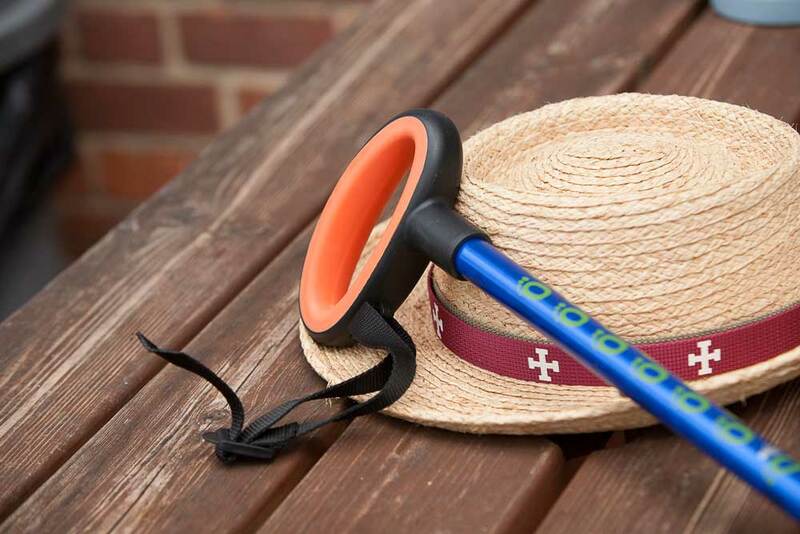 The over moulded cork handle is easy to grip, smooth and breathable. Ergonomic handle with wrist strap. 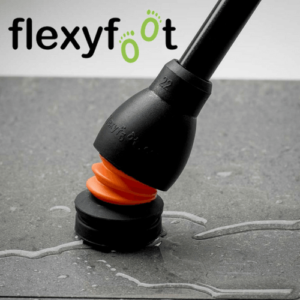 Ergonomically designed with a soft grip that improves comfort and stability by spreading the force over a wide area of the hand and wrist. This has the benefit of reducing the stress and impact for the user. 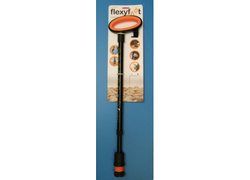 The ergonomic oval handle has been designed so the weight of the user is directly over the stick. This reduces strain and injury by keeping the wrist and hand in a natural position. Reminiscent of a Fischer style handle but has the benefit of being used in either hand. Height Adjustment: 70cm – 96cm. Tested to EN 1134-4-9 Static load and Fatigue Tests. I don't normally give 5 stars but Bill and the guys were so helpful with my order I just had to , thanks guys .